With four Grammy Awards, an Emmy, ten Number One hits, over fifteen top ten singles, numerous television and film roles, and a starring role in the most successful movie musical of all time, Olivia Newton-John can now add cookbook author to her resume. 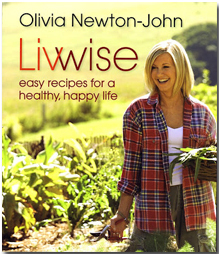 Diagnosed with breast cancer twenty years ago, Newton-John believes that good nutrition is the key to well-being – and has just written a new cookbook, LivWise: Easy Recipes for a Happy, Healthy Life, to spread the word. A “breast cancer thriver,” as she refers to herself, Newton-John looked as beautiful as ever and the picture of health at her recent book signing at the Barnes & Noble at 18th Street bookstore. Olivia Newton-John faces photographers at a book signing event for her new cookbook LivWise: Easy Recipes for a Healthy, Happy Life at the Barnes & Noble at 18th Street Bookstore in New York City, April 27, 2012. The secret of Olivia’s success is no secret at all. She exercises daily and eats a simple diet based mostly on salads, vegetables, fish, chicken, and some whole grains. She firmly believes that what we eat is the key to staying healthy and she shares this philosophy in her first cookbook, Livwise. According to the publisher, the recipes have been assembled using Olivia’s own recipes with the help of nutritionists, friends, and chefs from Gaia, her Australian health retreat and spa. The recipes are easy to prepare, delicious, and healthy and include salads, snacks, hearty main dishes and guilt-free desserts. The philosophy behind the book is the importance of eating a healthy diet, along with regular exercise, to help your body find its own natural balance. Royalties from the sale of her cookbook will benefit The Olivia Newton-John Cancer and Wellness Centre in her hometown of Melbourne, Australia, which is due to open in July 2012. For more information on The Olivia Newton-John Cancer and Wellness Centre, visit the official site at www.oliviaappeal.com.